The Waters Edge is inspired by Eastern seaboard architecture and the exotic merchant trade of the San Francisco Bay. 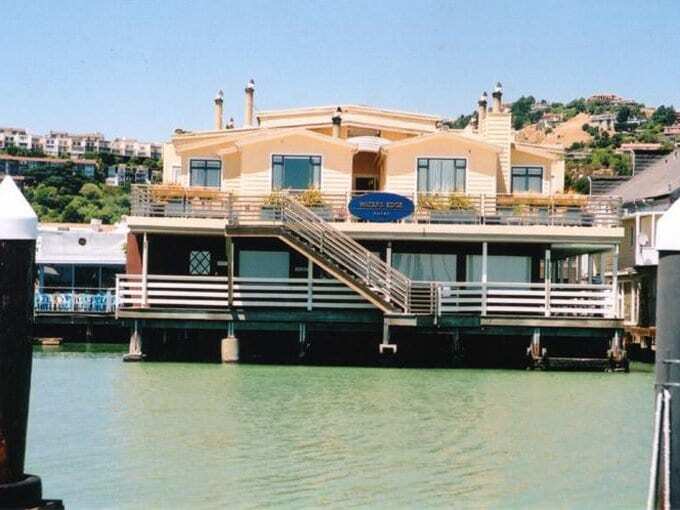 Located on the water in charming downtown Tiburon, the Waters Edge brings an added ambiance of global sophistication to this unique part of Northern California. Restful rooms feature crisp white feather beds, and comfy chaises with hand-knitted throws perfect for afternoon naps. Many rooms look out to stunning views of San Francisco and Angel Island. Stretching southward and forming the east border to Richardson Bay, the Tiburon peninsula reaches toward Angel Island State Park. Just steps from our door is the Tiburon Ferry, which carries pedestrians to Angel Island and San Francisco. The Napa Valley wine region is less than an hour away. Guestrooms: Nestled on an historic dock in charming downtown Tiburon, several of our guestrooms feature private balconies and views of San Francisco Bay. All of our 23 guestrooms, including two junior suites, feature a fireplace, white feather bed, state-of-the-art phone system with dataport and voicemail, CD player, cable TV with VCR, pay-per-view movies, A/C, full tub & shower, spa robes, and include complimentary deluxe continental breakfast with newspaper served in your room. Waters Edge is a non-smoking property. The Waters Edge Hotel is a proud participant in the Experience Rewards Club Meeting & Event Spaces. The Waters Edge has an elegant event space available totaling ideal for any occasion. The room can accommodate up to 35 people depending on the configuration. Our gracious and friendly staff is prepared to help with any and every arrangement necessary. For more information please email us.